A leisurely drive in the snow to deliver Christmas gifts suddenly goes wrong with a candy-fueled spell befalls your vehicle! Find the cause of the mysterious sweet blizzard and make your way through the house of three witch sisters with our Christmas Adventure – Candy Storm! Walkthrough. Our guide will take you through all the tips and tricks necessary to navigate the delicious gingerbread house and its many tasks. Whether you’re just getting started or need a little extra help, this section will walk you through the basics of Christmas Adventure – Candy Storm! By default, the game will keep you on the last selected, or newest player Profile. To create, delete, or change profiles, select the “Profile” button in the Main Menu. Access Options at any time to change game volumes, mouse, and screen settings. Your cursor will change depending on how you should interact with an area. A hand icon means you will be able to pick up an item. A gears icon means you can interact with an item. A magnifying lens indicates you can zoom in for a closer view. An arrow indicates you can move in the direction shown to a new area. Speak with characters in the game by clicking on them. Sparkles around an area indicate this is a Hidden Object scene. Click on this area to search for a list of items displayed at the bottom of your screen. 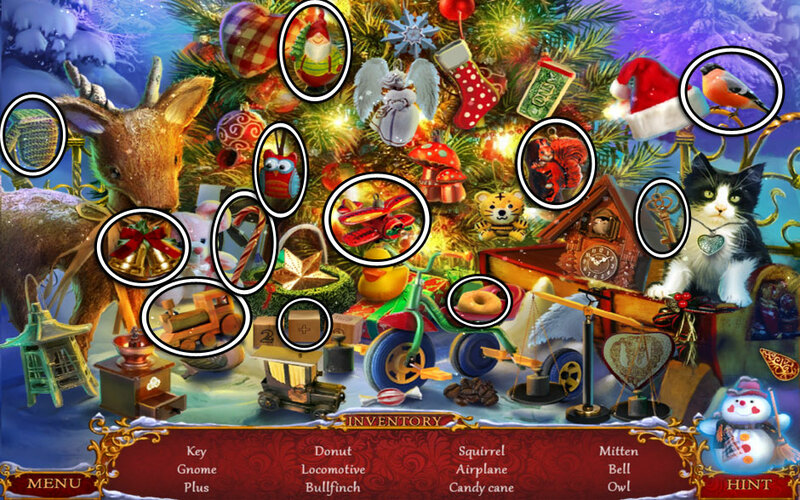 Find all the items listed to receive an Inventory Item, outlined in bold in our Christmas Adventure – Candy Storm! walkthrough. Click on the parchment in the lower left corner of your screen to display your Tasks. If you’ve forgotten what you need to do, or simply need a reminder, all active tasks will be displayed here. Click on the Hint button in the lower right corner to receive a hint regarding where to go or what to do next. If a Hint guides you to a location, or prompts you to close a window, it will not be used up. Hints are unlimited, but require time to recharge. Driving along a chilly winter road suddenly takes a turn for the bizarre with your car turns into sweets! Enter the gingerbread cottage and discover the cause of the holiday mayhem! The good spirit, Septer, informs you that your car has been changed into candy as a result of the magic of three old sisters who live nearby. Nearby is a gingerbread house covered in Christmas lights. The first elderly sister sits in her rocking chair near the fireplace just inside. Speak with the glowing blue spirit on the right. Septer will tell you what’s going on. Collect the Branch to the left, between the Christmas tree and the mailbox. Take a closer look under the stone bridge. Use the Branch to retrieve the Handle and add it to your inventory. Examine the door of the house straight ahead. Place the Handle on the door and click to knock three times. A hidden object area will appear over the sleigh in front of the house. Find the objects listed at the bottom of the screen. Once you’ve found them all, the Necklace will be added to your inventory. Take a closer look at the inside of your car. Click on the bag sitting on the seat to open it, then collect the Barrette inside to add it to your inventory. Notice the crow perched in the upper right corner of your screen. Use the Necklace on the crow to receive the Mosaic Part in return after it’s dropped. Examine the front door of the house again. Use the Mosaic Part on the empty slot to trigger a puzzle. The door is locked with a tricky lock! You will need to move all the parts to their proper locations. Yellow Snowman (Tip: Don’t eat him! ), Red Santa, and then the Green Nutcracker. You can move rows and columns horizontally and vertically by dragging them. The solution is shown below. 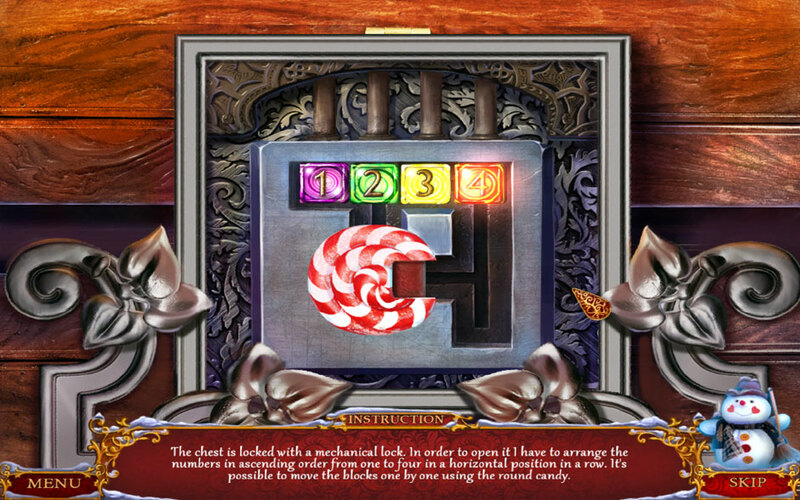 Upon completing the puzzle, you will enter the home. Speak with the first sister. After you talk with her, a hidden object area will appear in the back corner over the sewing machine. Find the objects listed at the bottom of the screen. Once you’ve found them all, the Glasses will be added to your inventory. Give the Glasses to the grandma. After she talks with you, she will give you the Drawer Key. Examine the coffee table. Click on the Wax Seal to add it to your inventory. Take a closer look at the dresser straight ahead. Use the Drawer Key to open the drawer beneath the kitten and collect the Birdseed Collect the Sponge in the music box before you exit the close-up. Look at the circular pot on the right. Click on the Snowflake Part to add it to your inventory. Examine the door straight ahead. You can’t do this puzzle yet, but be sure to collect the Lion Handle. Take a look at the wreath hanging in the upper left corner of the door. Click on the Christmas Hat to add it to your inventory. Look at the bird feeder hanging in the upper left corner. Use the Birdseed here and collect the Nut. Exit the close-up of the feeder and click on the hidden object area that appears on the right. Locate all the items listed at the bottom of the screen. Once you’ve found them all, the Stamp will be added to your inventory. Examine the green postbox. Place the Stamp and the Wax Seal in the slots to open it. Collect the Candy Fly inside to add it to your inventory. Zoom in on the coffee table. Use the Nut on the nutcracker and collect the resulting Drumsticks. Click on the Button 1/3 on his hat to collect that as well. Give the Candy Fly to the spider and collect the Empty Cup. Examine the water under the bridge. Use the Empty Cup on the water to acquire the Cup with Water. Examine the bird feeder in the upper left corner. Give the Drumsticks to the bear and collect the resulting Clockwork Key. Refill the now Empty Cup with water under the bridge again to obtain the Cup with Water. Take a closer look at the corner of the carpet. Use the Cup with Water to douse the syrup, then use the Sponge to clean it. Click to lift up the edge of the carpet and collect the Knitting Needles. Use the Lion Handle on the lion head to open the cellar hatch, then collect the Clock Hand sitting on top of the barrel inside. Give the Knitting Needles to grandma. A hidden object area has appeared over the shelves in the upper left corner. Find all the items listed at the bottom of the screen. Once you’ve found everything, the Skotch will be added to your inventory. Look down inside the cellar again. Use the Skotch to repair the Scoop and add it to your inventory. Examine the clock at the top of the dresser next to the door. Place the Branch Part you have in the outline toward the left. Use the Sponge to clean the clock face, then use the Barrette to pry the glass open. Use the Clock Hand on the face and leave it for now. Examine the circular pot on the right. Use the Clockwork Key on the Clockwork Mouse, then click to add it to your inventory. Take a closer look at the dresser in the back corner again. Use the Clockwork Mouse on the kitten, then collect the Blue Roll. Give the Blue Roll to grandma and head back outside. Once again, look under the bridge and refill the Empty Cup to acquire the Cup with Water. 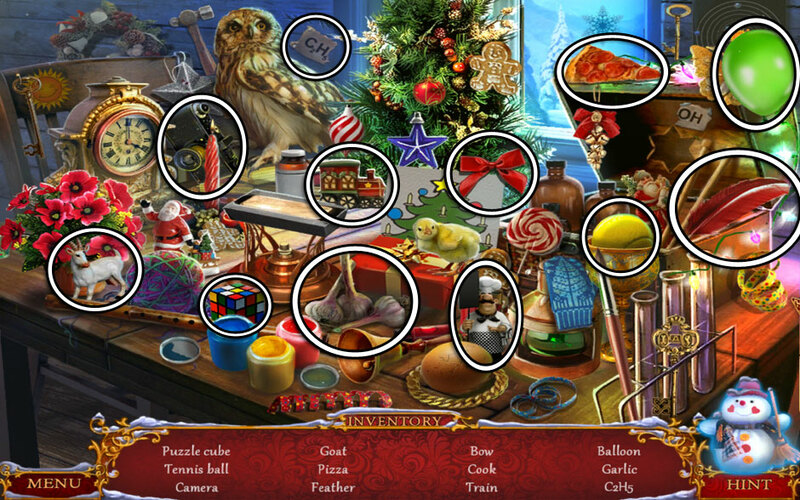 Click on the hidden object area over the Christmas tree on the left. Locate the objects listed at the bottom of your screen. Once you’ve located all of them, the Rake will be added to your inventory. Examine the circular pot on the right. Use the Rake to remove the spines and collect the Yellow Roll. Back in the main area, give the Yellow Roll to grandma. A crack will suddenly burst open the chimney, causing smoke to fill the room. Look at the break to trigger the appearance of a hidden object area over the fireplace. Find all the objects listed at the bottom of the screen. Once you’ve located them all, the Log will be added to your inventory. Take a look under the bridge and use the Log to help the beaver finish the dam. Click on the Bell in the mud where the beaver was previously to add it to your inventory, then use the Scoop to acquire the Scoop with Clay. Examine the break in the chimney again. Use the Scoop with Clay to repair the hole, then collect the circular Bullfinch Head puzzle piece propped up against the deer. Once the door is open, enter the Kitchen. Much like the first sister, the second sister is also busy knitting in a rocking chair. She is equally in need of help, however. Are you up for a little more search and find? Speak with the second sister on the left. Once finished, a hidden object area will appear straight ahead. Find the objects listed at the bottom of the screen. When you find all of them, the Soda Powder will be added to your inventory. Examine the table on the right. Click on the Carrot and the Growth Promoter to add them to your inventory. Take a closer look at the lantern hanging in the upper right corner. Use the Christmas Hat on the Santa Claus, then add both this and the Snowflake Part 2/3 to your inventory. Examine the stove straight ahead. Use the Soda Powder on the right pot, followed by the Cup with Water. Use the Growth Promoter on the middle pot, followed by the Sponge. Collect the Scapula sitting in front of it to add it to your inventory. Take a look at the shelf hanging over the refrigerator on the left. Collect the gold Angel’s Wing to add it to your inventory. Zoom in on the refrigerator. Give the Carrot to the rabbit and collect the Egg. Collect the Icebreaker before you leave as well. Exit to the Sitting Room. 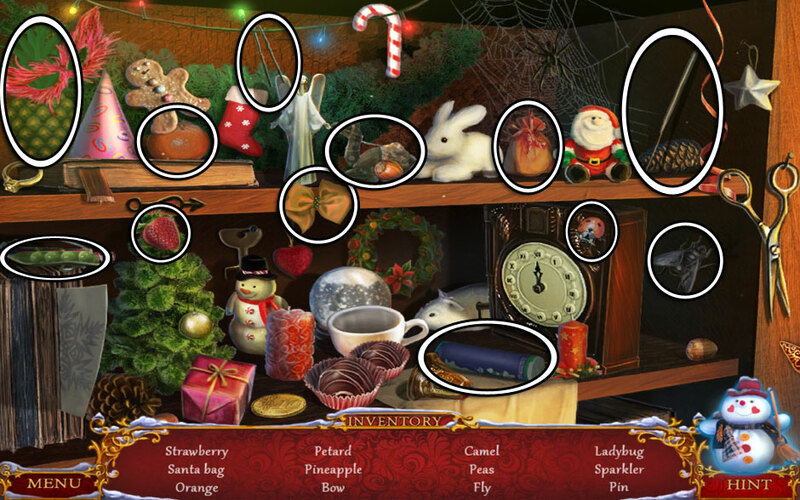 Click on the hidden object area over the fireplace. Find all the items listed at the bottom of the screen. Upon doing this successfully, the Wool Sock will be added to your inventory. Look at the circular pot on the right and use the Scapula to dig up the Handle and add it to your inventory. Take a closer look at the green mailbox and use the Icebreaker to chip the ice on the left side and acquire the Snowflake. Enter the Sitting Room again. Examine the wreath hanging near the door. Place the Bell beneath the red bow and collect the Cone that appears. Take a closer look at the clock hanging on the wall again. Place the Cone in the outline on the topmost gold door and collect the Ballerina that’s revealed. Zoom in on the music box on the dresser beneath the clock. Place the Ballerina in the slot and collect the Scissors that appear. Tip: It’s time to collect the remaining buttons! Head back outside to the Snowscape. Take a closer look at the bird feeder on the upper left. Use the Scissors to cut down the Button 2/3. Examine the inside of your vehicle. Once again, use the Scissors to cut down the final Button 3/3. Take a look under the bridge and refill the Empty Cup to acquire the Cup with Water. Give the Buttons 3/3 to grandma. Take a closer look at the wreath near the door again. Use the Scissors to cut out the Pattern and add it to your inventory. Examine the coffee table again and place the Pattern on the plate. Collect the resulting Lace to add it to your inventory. Give the Lace to grandma, then enter the Kitchen again. 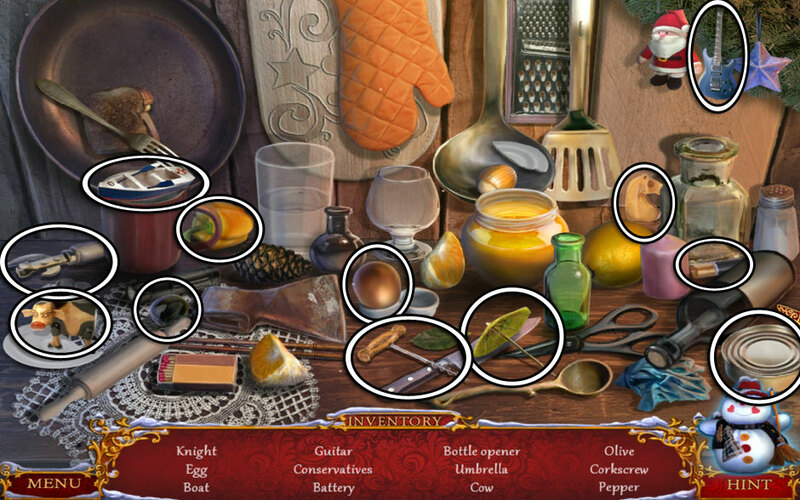 Take a look at the hidden object scene that’s appeared in the back corner. Find all the objects listed. Once you’ve found them all, you’ll acquire the Big Key. Look at the table on the right. Use the Egg on the chicken and collect the Strawberry hidden within. Examine the refrigerator on the left. Use the Big Key to open it. 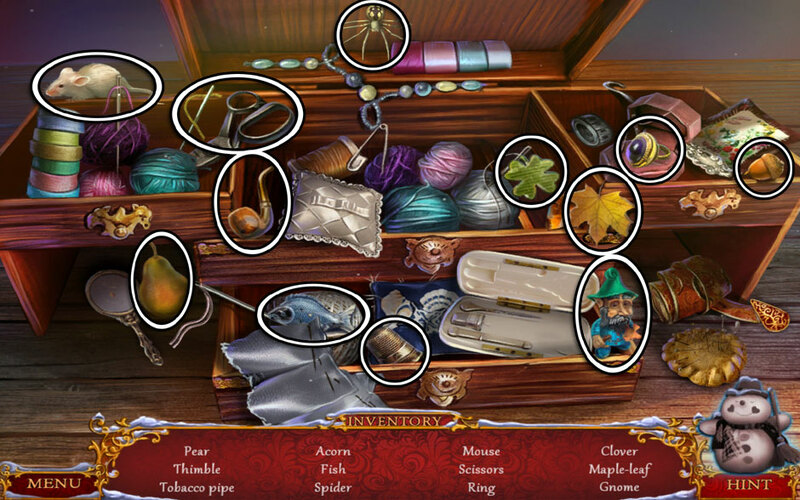 You won’t be able to collect any of the items inside just yet, but upon exiting the close-up, a new hidden object area will be available over the center table. Find all the objects listed at the bottom of your screen. Upon finding everything, the Spoon will be added to your inventory. Examine the inside of the fridge again and use the Spoon to obtain the Spoon with Butter. Collect the Snowflake Part 3/3 remaining in the tray to add it to your inventory. Take a closer look at the oven to the right of the stove. Use the Handle on the Scraper to add it to your inventory. Look at the decor over the stove. Click on the Candy Cane and the Branch Part to add them to your inventory. Return to the Sitting Room. Examine the clock on the wall again. Place the second Branch Part in the outline on the left to complete it. Collect the Matches that appear in the door. Click on the clock face to change the time to 12 o’clock, then collect the Small Key the mountaineer produces. Exit the house once again. 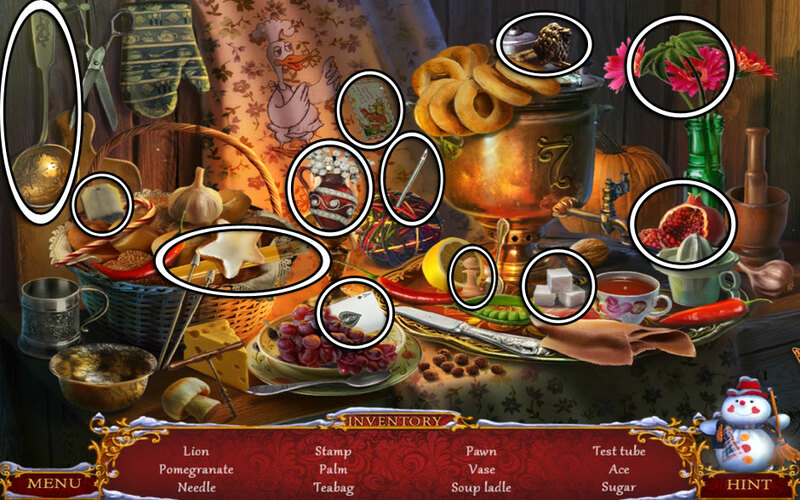 Click on the hidden object area which has appeared on the right. Locate all the items listed at the bottom of the screen. Once you do this, you will acquire the Red Roll. Give the Red Roll to grandma. Take a closer look at the curtains on the left. Use the Candy Cane to pull them open. Use the Snowflake Parts 3/3 on the base in the upper right corner to obtain the Snowflake (2). 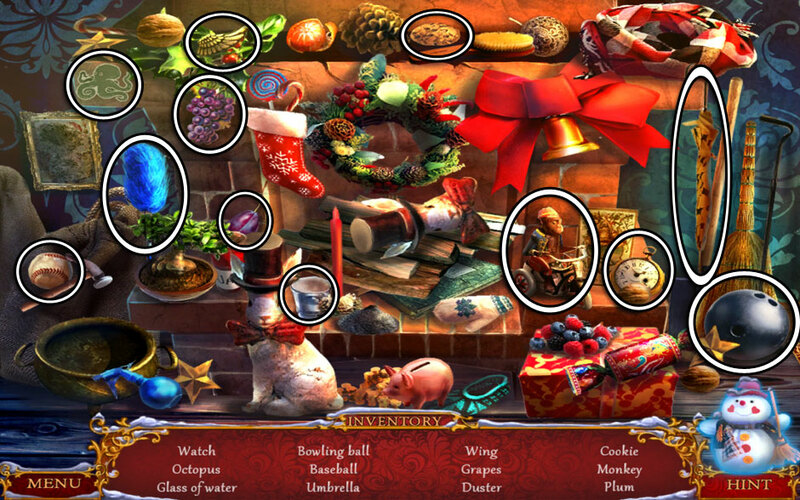 Collect the Antlers and place the Angel’s Wing on the figurine, then exit the close-up for now. Examine the shelf in the corner. Place the Snowflake and Snowflake (2) in the grooves on the lock on the left. It will break, revealing the Acid for you to collect. Zoom in on the stove at the back of the room again. Use the Acid on the pan on the left. Use the Wool Sock to finish cleaning the center pot. Use the Scraper to finish cleaning the pot on the right. Speak with the second sister to complete your current task and be assigned a new one. She would like for you to collect her 12 apples from outside. Back your way out to the Snowscape. Find the 12 apples hidden throughout the area. Their locations are shown below. Give the Apples 12/12 to the old woman, and she will hand them back to you, giving you a new task. 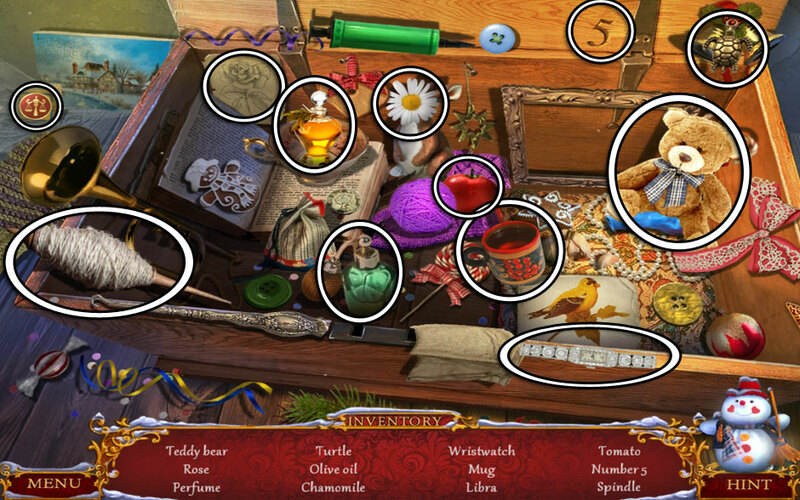 Click on the hidden object area on the center table. Find the objects listed at the bottom of the screen. Once you’ve located them all, the Star will be added to your inventory. Examine the decor over the stove. Place the Star in the slot at the top of the tree, then collect the golden Angel’s Wing the swan reveals. Look at the window on the left. Use the Angel’s Wing on the figurine, then click on the resulting Angel to collect it. 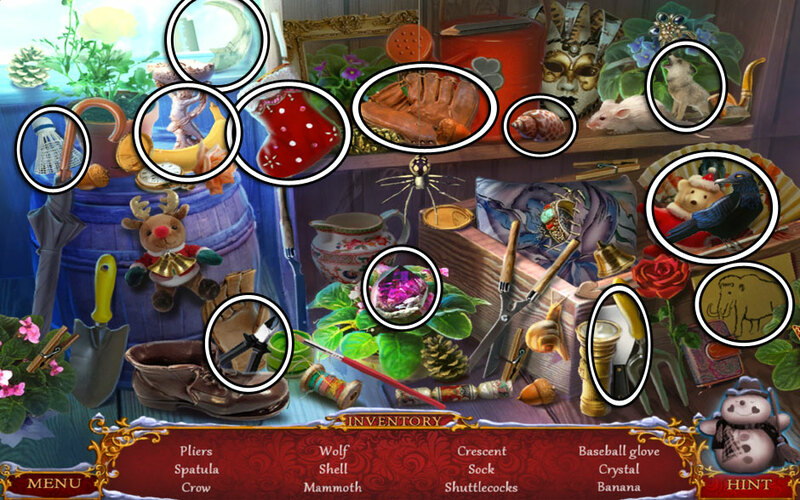 Click on the hidden object area over the shelves in the upper left corner. Find all the objects listed at the bottom of the screen. Once found, you will acquire the Juggling Ball. Examine the round pot on the right. Use the Cheese to lure out the Mouse and add it to your inventory. Take a closer look at the shelf in the back corner. Give the Juggling Ball to the monkey and collect the Musical Barrel and Fuse once the stuffing bursts. Look at the music box sitting on the cabinet beneath the clock. Place the Musical Barrel in the left slot and collect the Strawberry that appears. Look at the shelf above the fridge. Place the second Strawberry into the groove on the right, then click on the Sugar inside the container to add it to your inventory. Take a closer look at the stove straight ahead. Click on the center Pot to add it to your inventory. Examine the oven next to the stove. Place the Pot in the oven, then fill it using the Cup with Water. Next, add the Sugar, followed by the Apples and Spoon with Butter. Collect the resulting Very Hot Jam. Take a closer look at the stream. Cool the Very Hot Jam in the water to obtain the Jam. Give the Jam to the grandma. She will give you another task to complete. Look at the stove straight ahead. Click on the gold Pot to add it to your inventory. Examine the oven next to the stove. Place the Pot in the oven and add the Spoon with Butter. This will trigger a hidden object area to appear. Click on the hidden object area in the corner of the room. Find all the items listed at the bottom of your screen. Once you’ve done this, the Honey will be added to your inventory. Examine the refrigerator on the left. Use the Mouse to open the sack on the bottom shelf and obtain the Cocoa. Take a closer look at the oven again. Place the Honey, followed by the Cocoa into the pot. Stir the ingredients with the Spoon and collect the resulting Pot with Chocolade. Examine the stove again. Use the Pot with Chocolade on the chocolate mold. Click on the Chocolate Bunny to add it to your inventory. Speak with the old woman. It’s finally time to head upstairs! The third and final sister is upstairs, tending to her many plants. Make your way up the steps to the final sister and free your car from the candy storm! 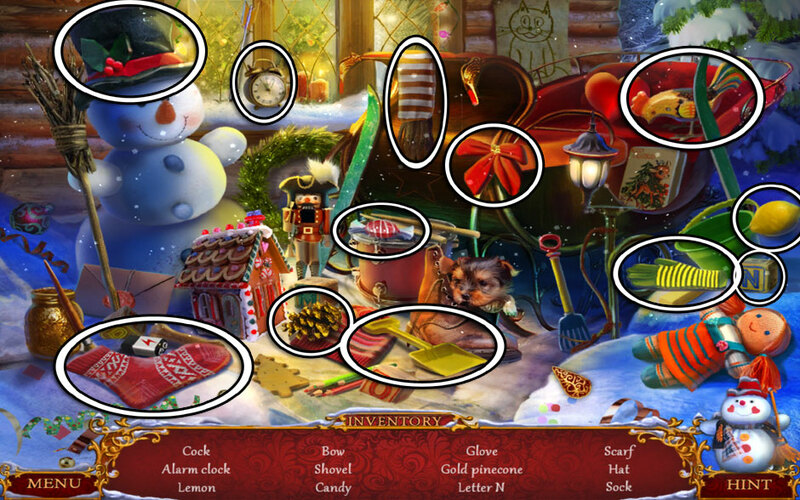 Click on the hidden object area over the sleigh next to the house. Find the objects listed at the bottom of the screen. Once found, the Hairdryer will be added to your inventory. 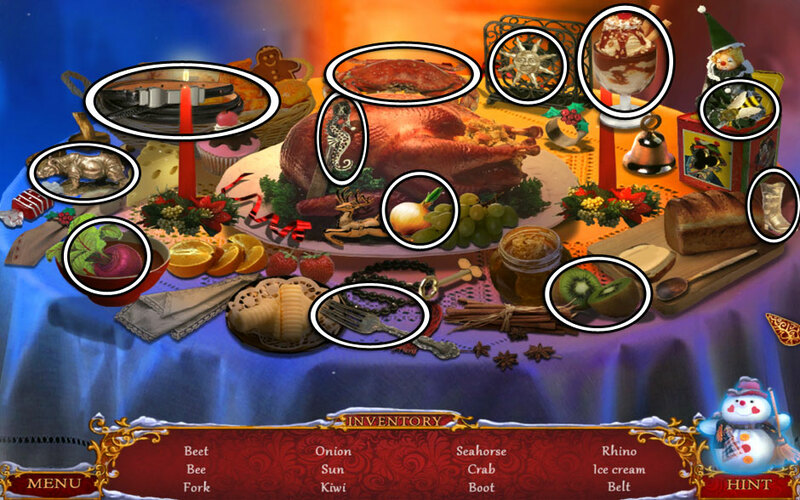 Select the hidden object scene over the Christmas tree on the left. Locate the items shown at the bottom of your screen. Upon completing the area, the Magnet will be added to your inventory. Examine the circular pot on the right. Use the Magnet to retrieve the Small Key (2) and add it to your inventory. Take a closer look at the crack above the mantle and use the Small Key and Small Key (2) on the outline on the box. Place the Antlers on the deer. Collect the Webbing from the open box. Give the Webbing to grandma. She will give you the Pullovers. Use the Hairdryer to remove the cotton candy webs from the stairs, then head up to the next area. Speak with the third sister upstairs. She will give you a new task. Give the Letter to the old woman. 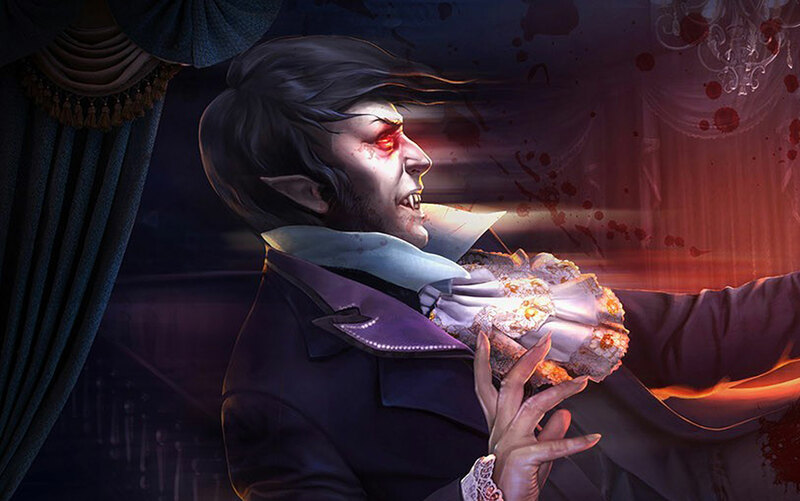 A hidden object scene will appear on the right. Find the objects listed at the bottom of the screen. Once you’ve found them all, you’ll get the Paints. Take a closer look at the book lying on the floor. Place the Paints here and collect the Small Star (Green). Examine the coffee maker on the left. Click on valve to turn it on, filling the cup with Boiling Water. Collect this, as well as the Bulb 1/3 and the Sledges (sled). Take a closer look at the shelves on the left. Collect the Wrench and the Bulb 2/3. Look at the window on the right. Click on the Suspension to add it to your inventory. Examine the watering system at the back of the room. Click on the Lightning and the Small Star (Yellow) to add them to your inventory. In the main area, collect the Antlers from the wall next to the old woman. Head back down to the Kitchen. Click on the hidden object area in the right corner. Locate the items listed at the bottom of the screen. Upon doing this successfully, you will be rewarded with the Dragon. Take a closer look at the window on the left. Use the Suspension on the Christmas Ball (2), then click to add it to your inventory. Look at the upturned corner of carpet to peek into the cellar again. Use the Wrench to loosen the bolt and obtain the Pipe. 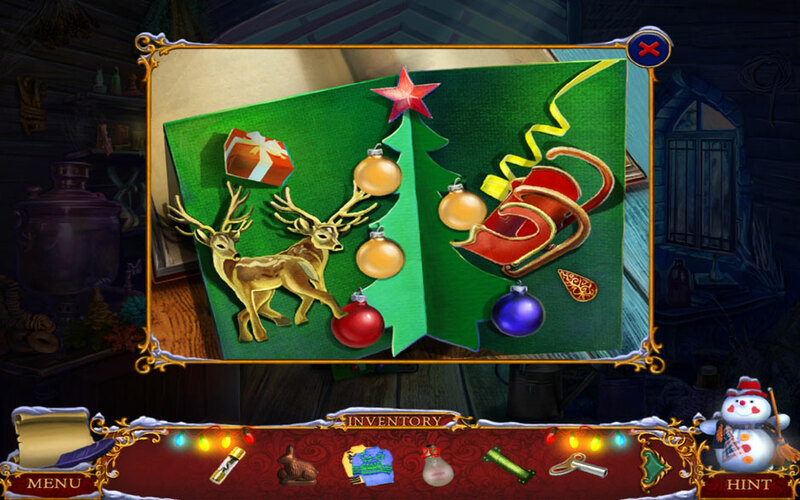 Examine the crack in the chimney above the mantle and place the Antlers on the Deer, then add it to your inventory. Examine the decor above the stove. Place the Deer in the slot on the left. Collect the resulting Pair of Deer. Take a closer look at the shelves on the left. Use the Matches to light the Candle. Collect it by clicking on it. Use the Dragon on the groove in the box to open it and collect the Lantern Key Collect the Three Snowballs above the box as well. Examine the window on the right. Use the Boiling Water to melt the ice. Open the latch and collect the Wire. Examine the table on the right. 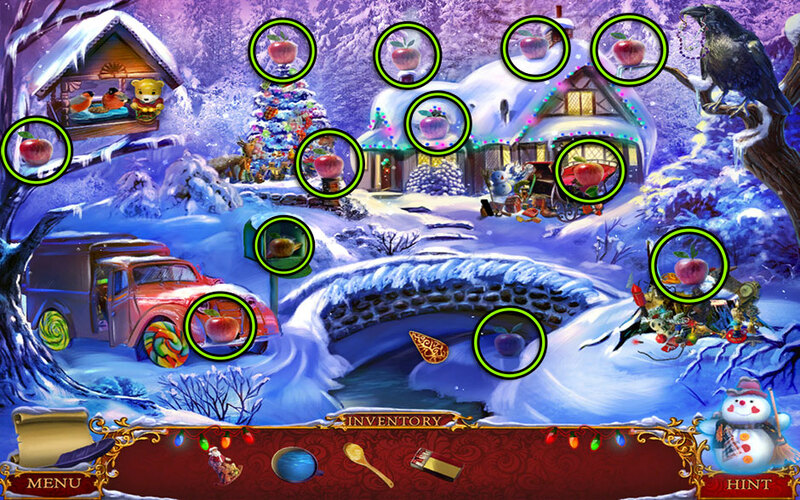 Use the Three Snowballs on the slots in the box to open the top, revealing the Hammer. Take a closer look at the book lying on the floor. 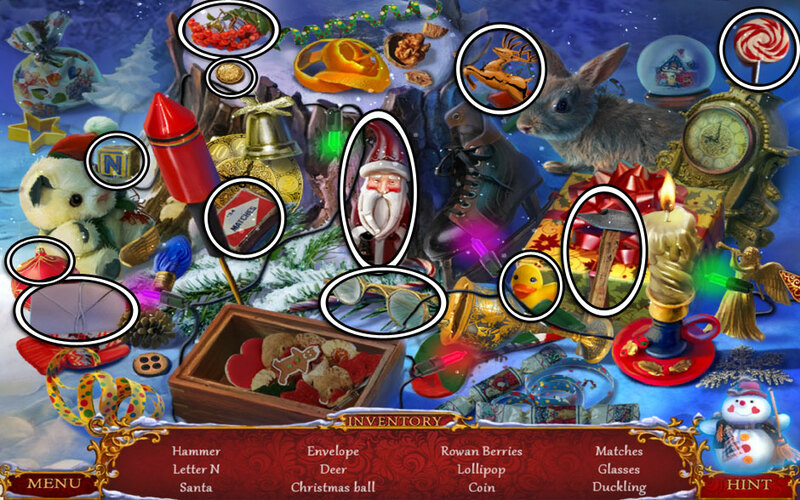 Place the Brush here, as well as the Pair of Deer, the Christmas Ball and Christmas Ball (2), and the Sledges (sled). A puzzle will be triggered. The postcard needs to be colored with the correct colors. It’s easy to define the proper color.. first, define it and then select it on the palette, then apply the paintbrush to the color’s corresponding area! Tip: The solution is shown below. Upon completing the puzzle, click on the Postcard to add it to your inventory, then collect the Bolt wedged in the floor. Give the Postcard to the third sister. A hidden object area will appear over the back of the room. Find the objects listed at the bottom of your screen. Upon completing the area, the Cactus will be added to your inventory. Head back downstairs to the Kitchen. Give the Cactus to the second sister. She will give you the Cogwheel. Look at the watering device at the back of the room again. Use the Toothpick to chip away the debris clogging the sprinklers. Use the Candle to melt the ice over the valve wheel. Click to turn it, however a leak will spring up. Repair the broken hose with the new Pipe. Speak with the woman again, then take a closer look at the potted poinsettia on the left. Use the Cogwheel on the circular groove, the Fuse in the groove on the right, the Wire on the box, and the Bulb 3/3 on the fixtures up above. Exit the close-up to discover a new hidden object area. Find the objects listed at the bottom of your screen. Upon completing the area, you will be rewarded with the Button. Make your way back outside. Examine the bird feeder on the upper left. Use the Pullovers on the birds, then collect the Number 2 that appears. Zoom in on the chest on the lower left. Use the Number 2 here to trigger a puzzle. Move the 3 from the horizontal row to the vertical column beneath the 1. Move the 4 from the horizontal row to the vertical column in the bottom slot. Move the 3 back over from the vertical column to the first slot in the horizontal row. Move the 2 from the horizontal row to the vertical column beneath the 1, where the 3 just was. Move the 3 back over to the vertical column. Slide each number – 1, 2, 3, and 4, (up) and to the left to complete the puzzle. The solution is shown below. 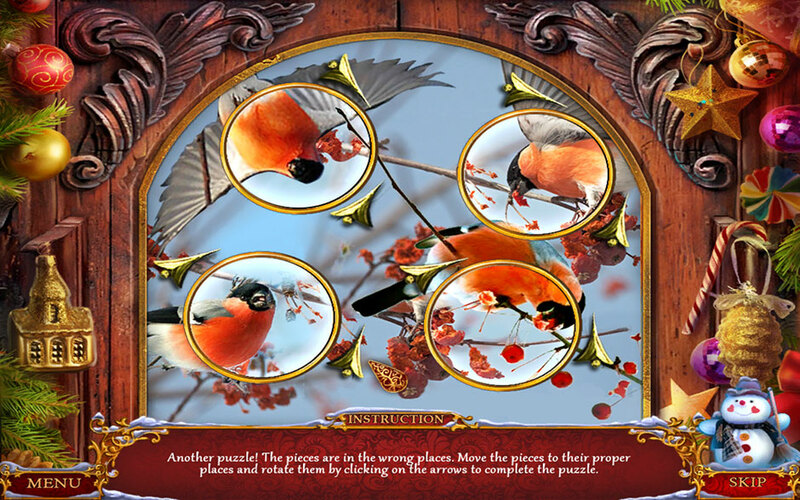 Upon completing the puzzle, a hidden object area will appear. Find all the items listed at the bottom of your screen. Once you’ve completed the area, the Insulating Tape will be added to your inventory. The hidden object scene will resurface right away. Find all the objects listed, then collect the Crowbar. Examine the poinsettia plant hanging on the left. Use the Insulating Tape on the wire and the Button on the panel. Click the button to switch on the lights. Examine the staircase. Use the Crowbar to pry off the loose wooden board and collect the Handle hidden beneath it. Look at the coffee maker on the left. Use the Handle and the Bolt to collect the Secateur. Take a closer look at the hanging poinsettia again. Use the Secateur to collect the Lilac and add it to your inventory. The third sister will speak with you again, giving you the Maple Syrup. A hidden object area will appear at the back of the room. Locate the items listed at the bottom of your screen. Once finished, you will acquire the Poinsettia. Examine the coffee table. Use the Lilac, the Poinsettia, the Chocolate Bunny, and the Maple Syrup on the mortar and pestle. Click to crush it all together. You will obtain the Magic Spell. It’s time to set things straight! Exit to the Snowscape. Take a closer look inside your car. Use the Magic Spell on the interior. Congratulations! 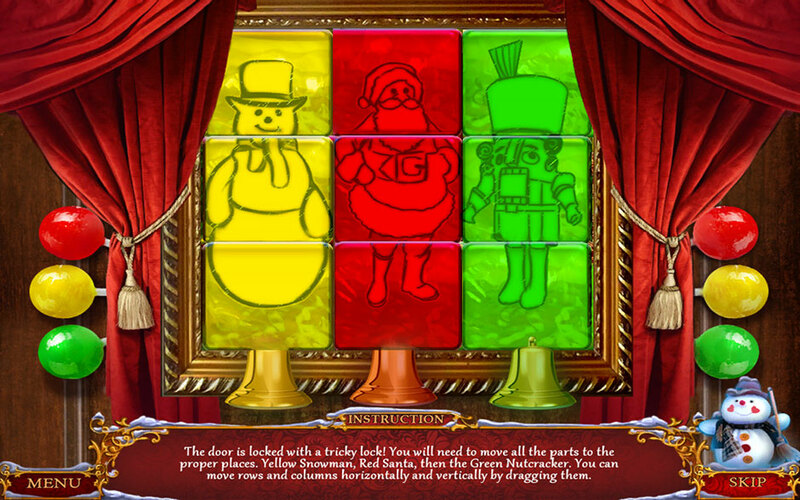 You’ve completed our Christmas Adventure – Candy Storm! Walkthrough! For more great tips and tricks, visit our blog! The Christmas Adventure – Candy Storm! Walkthrough is meant as a guide and does not contain cheats, hacks, or serials.